After a very relaxing time on the houseboat in Kerala we flew to Delhi. Our adventure in Delhi started as soon as we sat in a taxi and told the taxi driver, who spoke no English, where we wanted to go. He nodded and off we went only to stop 10 metres out of the airport to ask a group of homeless men the way to where we were going. They did not know and neither did our driver, so we told him to just head in the general direction of the area we were going to. Luckily we were staying with my friend Meg from university and she very patiently gave the taxi driver instructions on the phone. 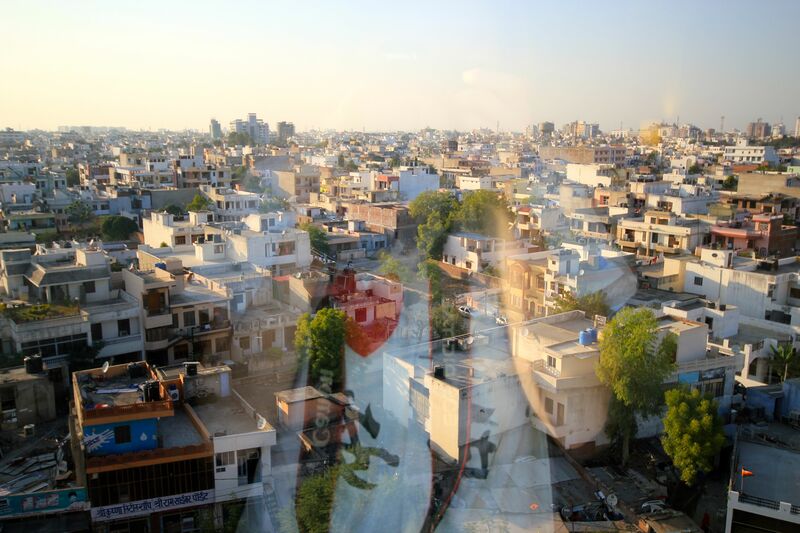 After circling around the area a couple of times we had finally arrived in Gurgaon – a satellite city of Delhi. Gurgaon is a new part of Delhi and mostly consists of office buildings for various IT companies, but also has some residential blocks. The buildings look like any other business district, but the roads are still being built and repaired and the cows and stray dogs roam around the shiny glass buildings freely. 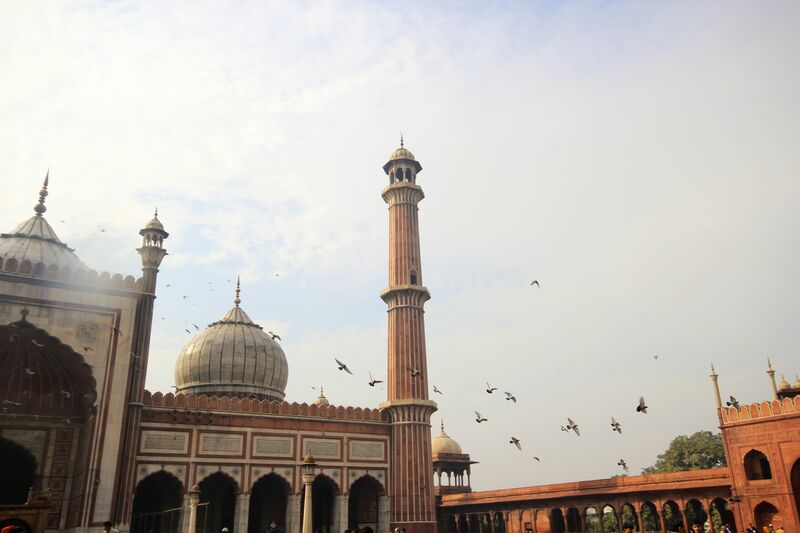 We did a lot of sightseeing in Delhi and to our surprise discovered a lot of Islamic heritage and history in Delhi – something we had not realised before. It is of course the heritage of the Mughal Empire and the emperors were of Turkic origin. 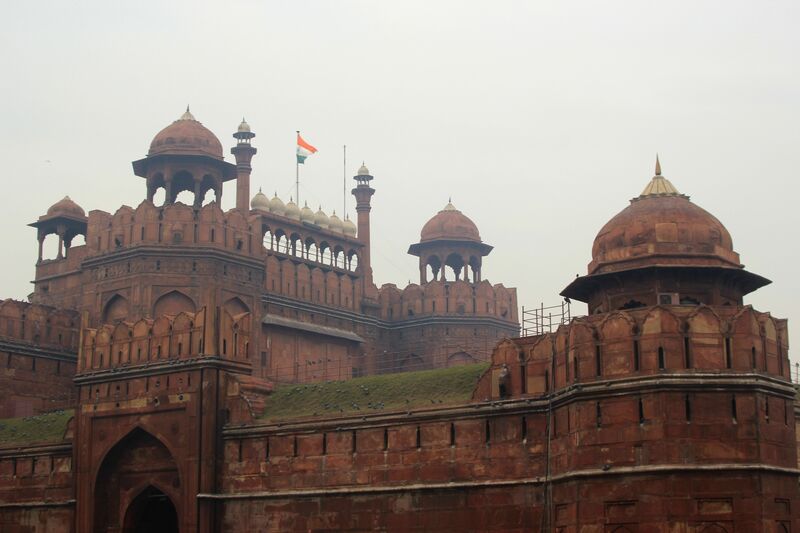 We saw the Red Fort on our first day, which was built by Shah Jahan in the 17th century when he decided to move the capital from Agra to Delhi. The fort comprised the emperor’s and his concubines’ living quarters, an audience hall for the public, a mosque, parks and many more. All these buildings used to be decorated with gemstones, gold and silver, which has now all been lost. A lot of the treasures were sadly looted and stolen when the British Empire took over, now we can only imagine what it once looked like. Red Fort is in Old Delhi, which is a charming, mad and chaotic maze of tiny streets full of bazaars, restaurants, shops, temples and mosques. 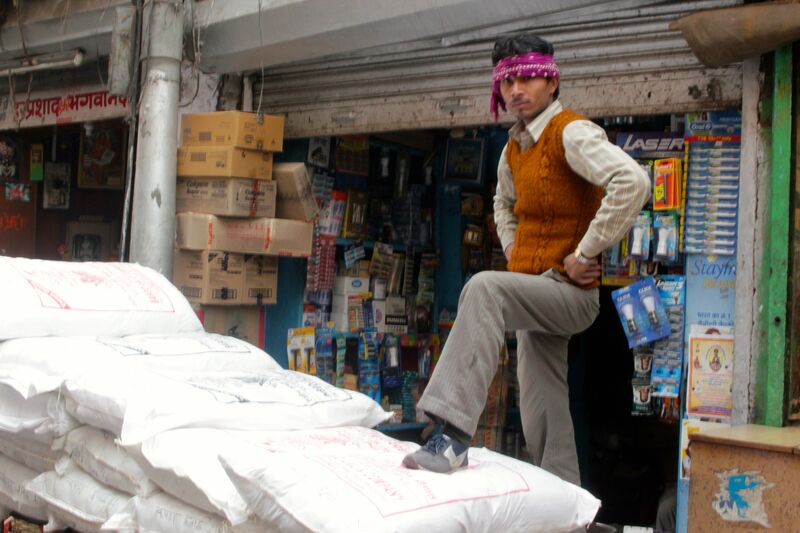 We thought we had been seasoned by the chaos of China, but there was nothing that could have prepared us for the epitome of chaos we found ourselves in – we were in Chandni Chowk Bazaar. We went to Karim’s, which is a famous restaurant specializing in Mughal cuisine (meaning meat, meat, meat and bread). It was no glamorous place, but the food was exquisite. We then decided to walk around and admire the scenery. So we walked past a herd of goats, numerous cages of chickens, tens of shops and restaurants with men cooking naan breads in a tandoor. We sat down in one of the many tea houses and had the most wonderful strong and sweet milk tea and watched the world go by from a relatively safe distance. 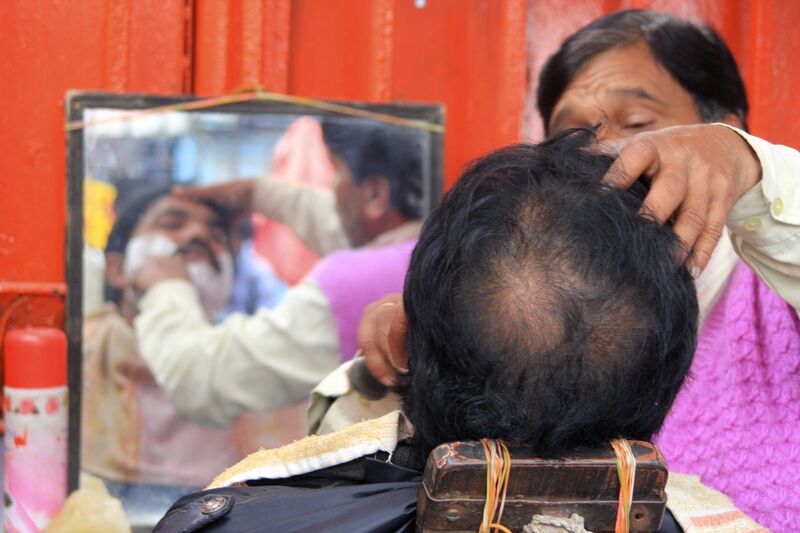 We saw daily activities like shaving and sewing taking place by the roadside and the array of people was very colourful indeed. We also saw groups of people outside nearly every restaurant, just squatting in a large group, which we found curious. We later found out that those people were being given food as they could not afford any. This also happened outside temples, where huge queues were formed. People who can afford it would provide food or money or volunteer their time to serve the poor and so improve their karma at the same time. We also walked around New Delhi, which is a city planned by the British to make them feel a little closer to home perhaps. 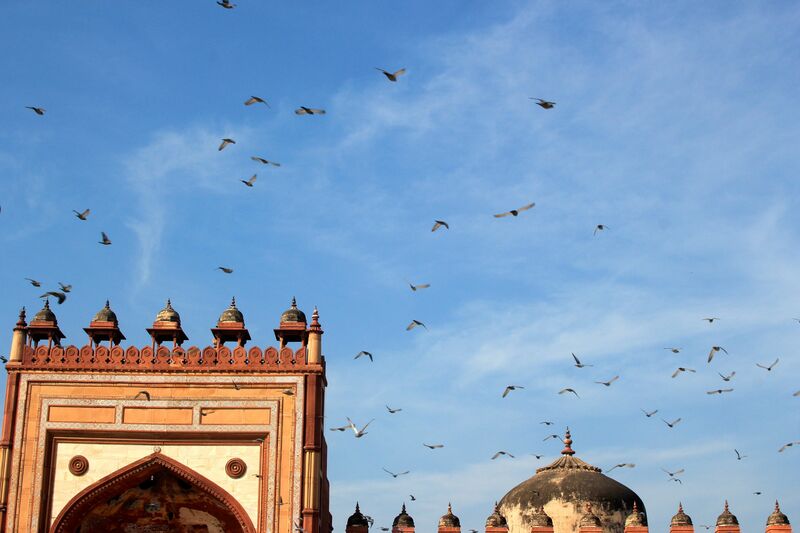 New Delhi has wide streets, fancy hotels and is complete with Connaught Place, which is a very large circle surrounded by marble colonial buildings and green spaces. 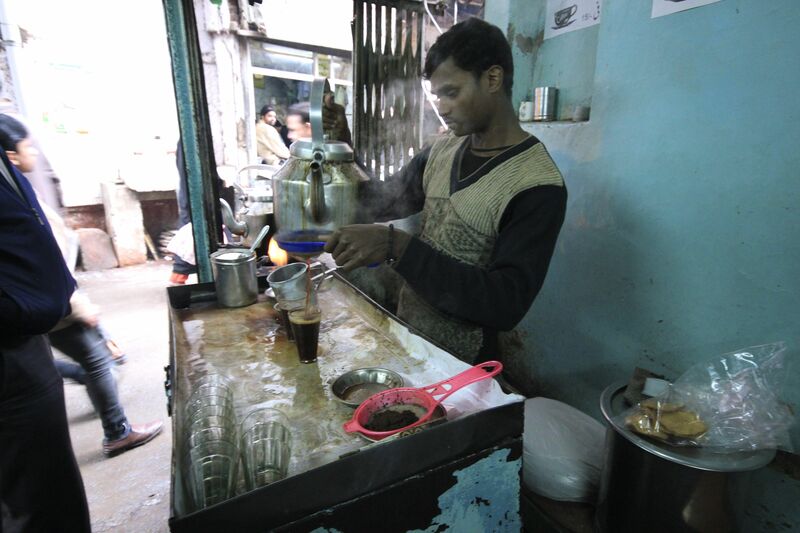 It may have once been a very English-like place with gentlemen wearing bow hats and women wearing long dresses walking around, but it is now a very touristy area of Delhi with the usual sights of tourists, dirt and poverty wherever you look. There were plenty of so called emporiums, which are huge mall-like shops selling handicrafts and fabrics made in India. We went into one of these places and nearly bought a Persian carpet as it was just so exquisite. It dawned on us, though, that we have no home currently and therefore no place or funds for a luxury carpet. But we could not walk out empty handed, so David had a suit made to measure. 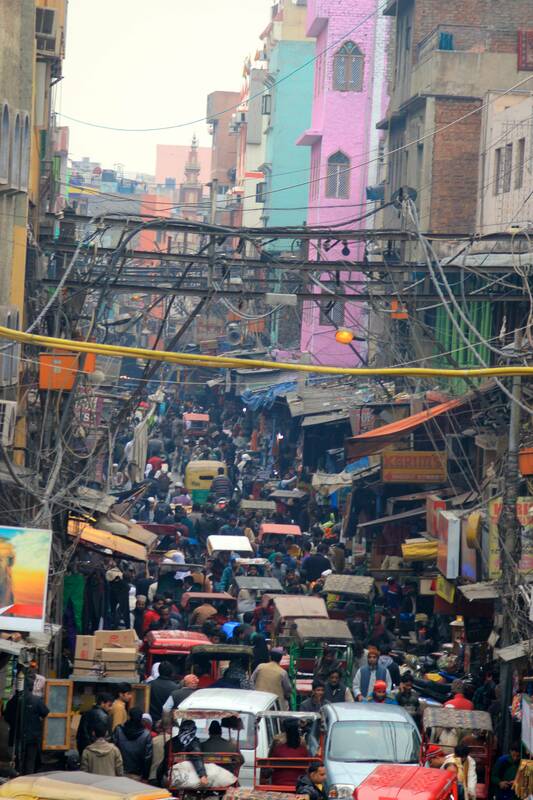 I did not become a fan of Delhi. I had a great time seeing my friends there and catching up, but the city itself left me quite unmoved compared to the other places we saw. I found it very hard to ignore little children who would come and kiss our feet as we sat on a rickshaw or who would dance or do other tricks in order to melt our hearts. Also, as charming as cows and dogs are, seeing them roam around everywhere aimlessly was not such a nice sight and I do not think they are happy doing that. Mind you, Delhi had more dogs than cows. I did hear that most of these dogs should be neutered and are getting fed by people. 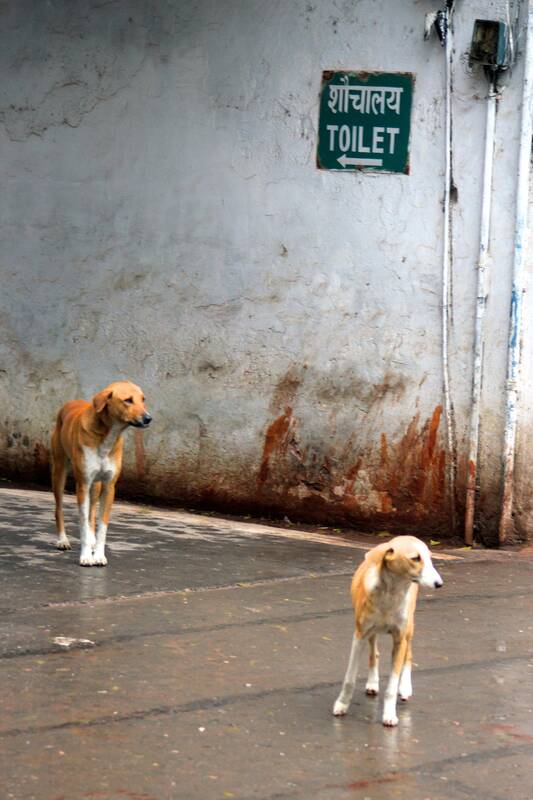 So they are taken care of to an extent, but a big city place is hardly a place for groups of dogs and other animals. 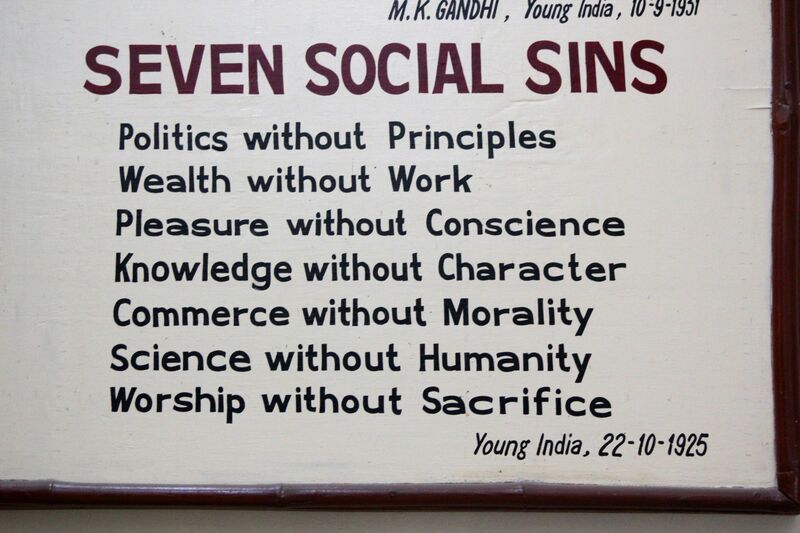 One of the highlights for me was visiting the Gandhi museum. After curiously wondering at an elephant gone crazy with about 200 policemen outside the Raj Ghat, we went into the park and saw the place where Gandhi’s body was cremated in 1948. The place has become a bit of a pilgrimage sight for people and we joined a number of other barefoot people to take a walk around the platform on which his body was burned. We then went to a museum displaying photos and artefacts from his life. What a great man he was with his compassion for the poor and non-violent ways. 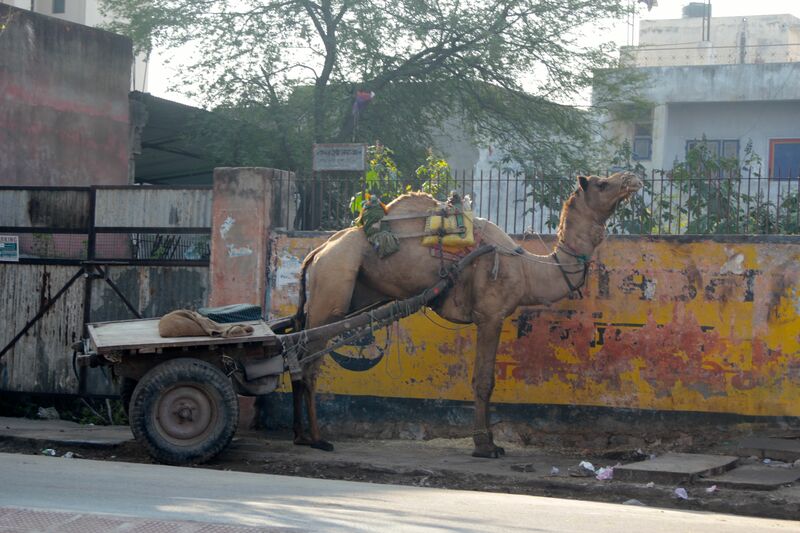 We hired a taxi and a driver in Delhi to take us to Agra and Jaipur. 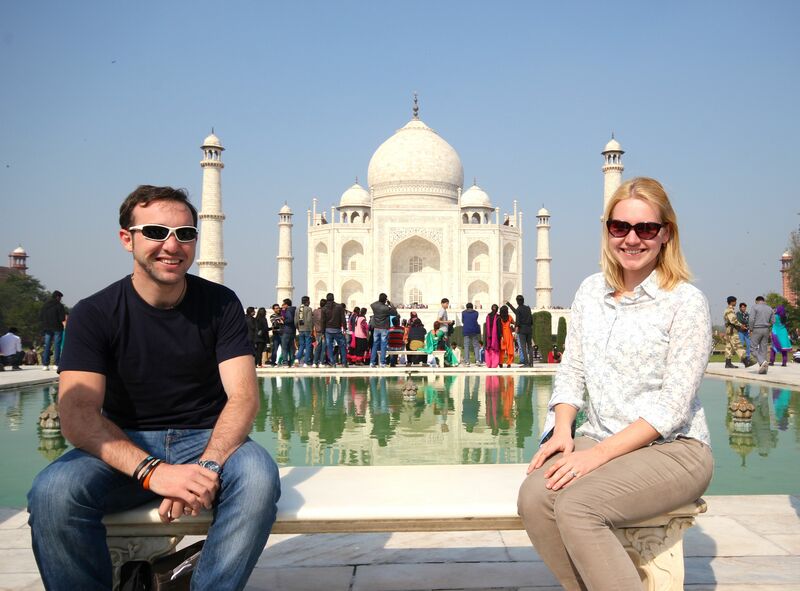 Our first stop was Agra – a very average industrial town of India, yet it holds the greatest treasure of the country – the magnificent Taj Mahal. We could obviously not miss this sight and joined the thousands of tourists to gaze at the beauty of this monument to love (although we later found out that the wife had asked the emperor to build it for her before she died). Our expectations were quite high but we were also aware that as a huge tourist attraction this place may have become a little tacky and lost some of its glory. We were wrong. There were plenty of tourists, of course, but seeing the building completely blew us away. I am not sure how else to describe it but use the word perfect. It is perfectly symmetrical, decorated with semi-prescious stones, built in dazzling marble, engraved in minuscule detail and look as hard as you wish but no mistakes will be found. What was more astonishing was the insight that the 20,000 workers brought over from Persia had. 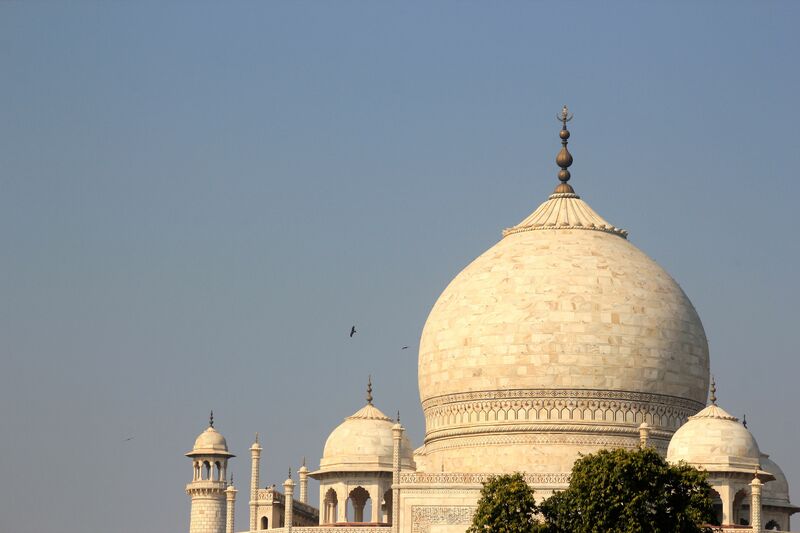 For instance, the four minarets surrounding the mahal are leaning very slightly outwards so that in case of an earthquake they would fall outwards and not crush the palace. There are numerous optical illusions to make everything seem the same size looking from any angle or distance. Unfortunately some people visiting the place seem to be dweebs. They have to close the place down once a month in order to replace all the stones stolen from the walls and repair the work of self-proclaimed carvers. Stone inlay work on the sides and inside of the buildings. 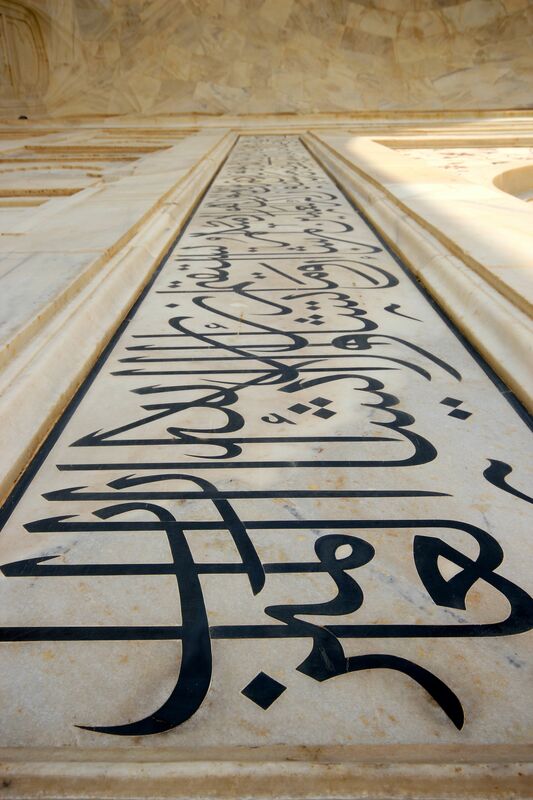 Surahs from the Koran are used to decorate the palace inside and out. 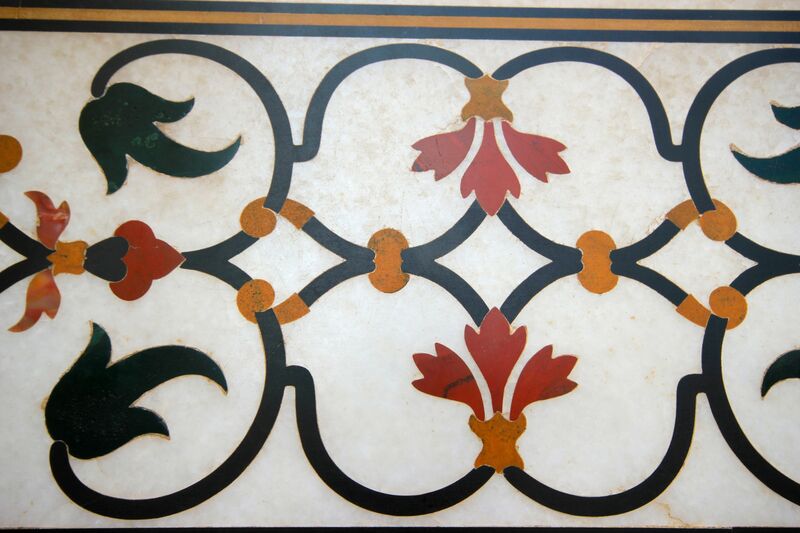 These are also carved from Onyx stone and laid into the marble. The size of the letters increases as they go higher in order to make it all appear as the same size when looking at it from afar. As I am sure you know the Taj Mahal was built in the 17th century by the Mughal emperor Shah Jahan (who also built the Red Fort in Delhi and many others) for one of his wives Mumtaz Mahal, who died when giving birth to her 14th child at the age of 38. It took 22 years to build, which is symbolised by the 22 steps leading up to the platform where the palace stands. 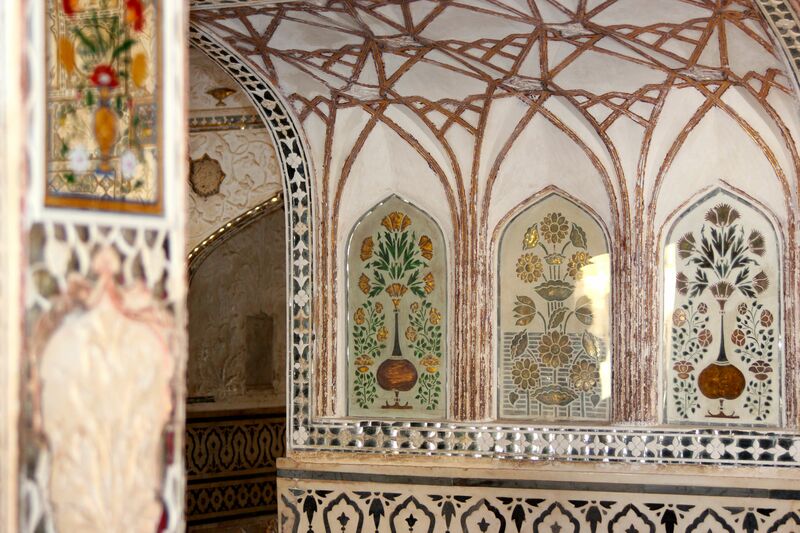 The place was never intended to be residential, but a monument to Mumtaz. 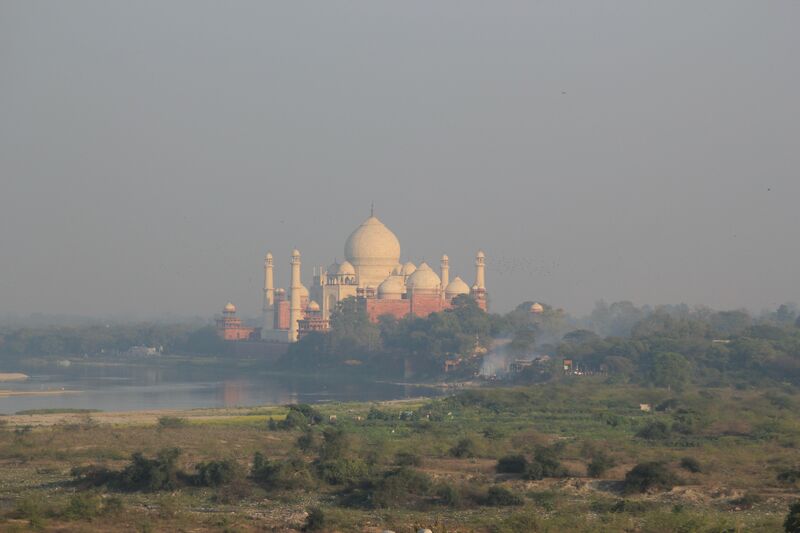 It now holds the tombs of both Shah Jahan and his wife. There is an urban legend saying that the hands of all the 20,000 Perisan builders and craftsmen were chopped off to stop them from replicating the Taj Mahal. In actual fact they were all paid a sum of money to keep them quiet and to keep them from going back to what is now Iran. Hence there are now families in and around Agra with Persian roots. As you may imagine, it cost an unimaginable number to build with precious and semi-precious stones from all over the world, marble from Rajasthan and workers from Persia. When the Taj Mahal was complete, Shah Jahan had a plan to build the exact replica of the Taj Mahal in black marble across the Yamuna river in order to keep it symmetrical and balanced. When his son Aurangzeb found this out he decided to overthrow his father and imprison him before he spends any more of his inheritance. His prison was no usual prison though – it was a part of the Agra fort, where he had all comforts he needed and he had a view of his beloved Taj Mahal until he died. While in Agra we also visited the small city of Fatehpur Sikri, which was built by Shah Jahan’s grandfather Akbar in mid-16th century. The city is really a very big fort where the emperor lived with his three wives – a Hindu, a Muslim and a Christian. He sounds like a real vote catcher. Akbar struggled for years to have children and decided to go visit a holy man, who lived in Fatehpur Sikri. The wise holy man prayed for him and told him that the Hindu wife will bare a son for him. He then most probably went home with some flowers and chocolates for the Hindu wife to create a mood for baby-making. And surprise, surprise – a baby boy was born 9 months later. The emperor then decided to build a fort to where he saw the holy man. He built the biggest quarter for his Hindu wife, the Muslim and Christian wives’ apartments were significantly smaller. The Hindu wife also had a separate kitchen as she was a vegetarian. 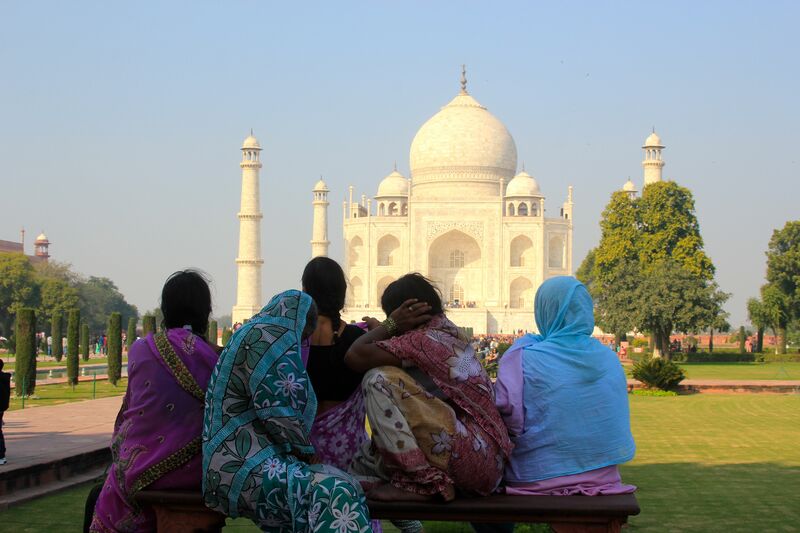 After seeing the wonders of Agra we set off for Jaipur, which is in the state of Rajasthan a.k.a the place of kings. We stayed in a very nice hotel, which was a welcome change from barely functioning showers and grubby beds, which we had experienced so far. We soon set off for a walk to the centre of Jaipur also known as the pink city due to the colour of the buildings in the city. They are really not that pink, but when the Prince of Wales once came to visit he said they look pink and nobody was brave enough to question his sense of colour. The old town of Jaipur is like the old town of Delhi – full of people, animals, shops and just too much happening at every step. 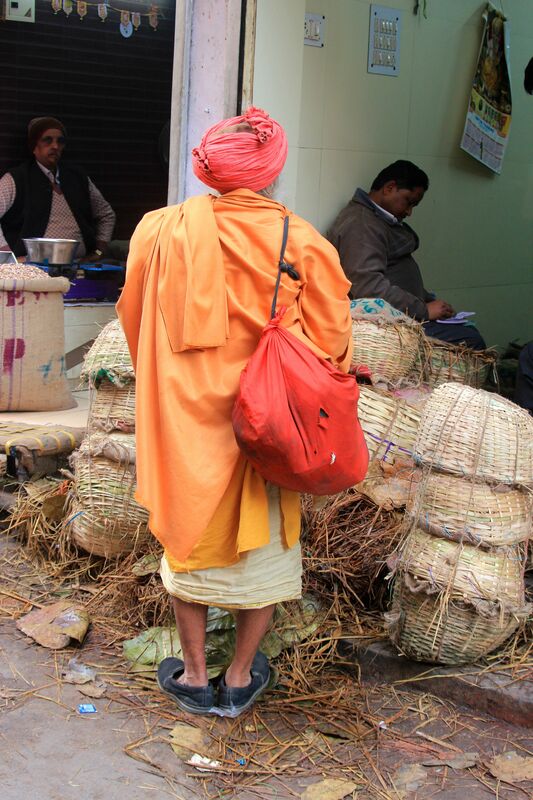 After dodging tens of shopkeepers trying to flog us pashminas for more than triple the price, a visit to a temple and a cup of tea we witnessed a procession of elephants heading to a temple. The sighting of elephants and camels got so normal that I soon stopped taking photos of them. 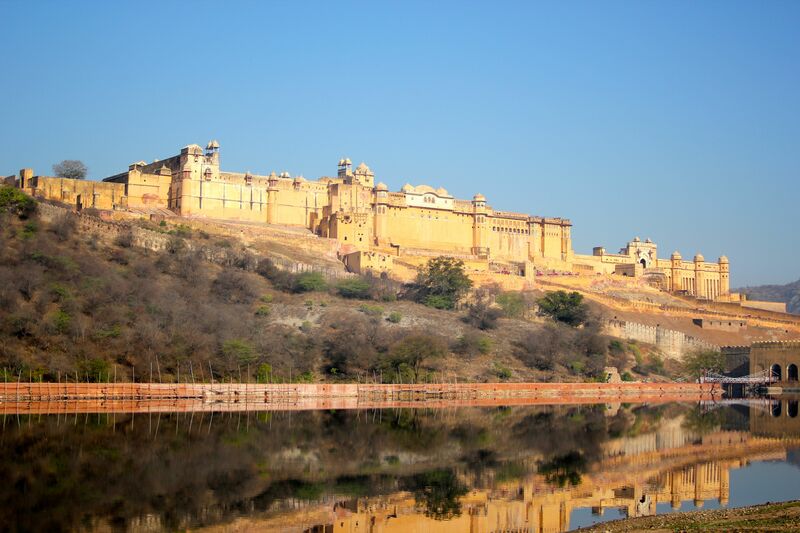 On our next day we visited Jaipur’s most famous sight – the Amer Fort. The fort was built by Raj Man Singh mostly because he wanted a bigger palace after his old palace had become too small for him. 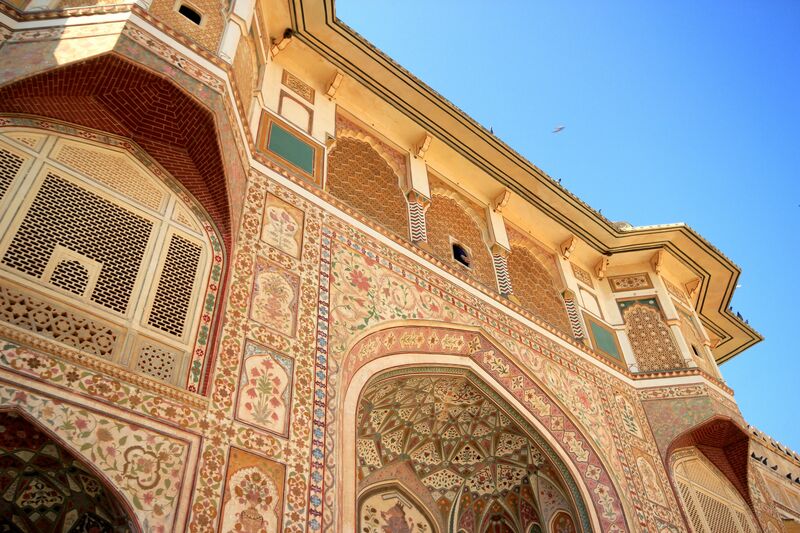 The fort is considered one of the prime examples of Hindu architecture, which, for instance, uses a lot of animal motifs, which are banned in Islamic and Mughal architecture. The fort was another example of the riches the emperors gathered for themselves with precious stones everywhere, big courts for their concubines, halls of mirrors with mirrors imported from Belgium and other riches that seem unbelievable now. An interesting was that the ladies of the court would never be seen in public. All the windows had drills in front of them to hide the ladies but still enable them to see what’s happening outside. Their life in the palace was not lacking anything, to be honest, but the lack of freedom to move freely must have felt rather limiting. 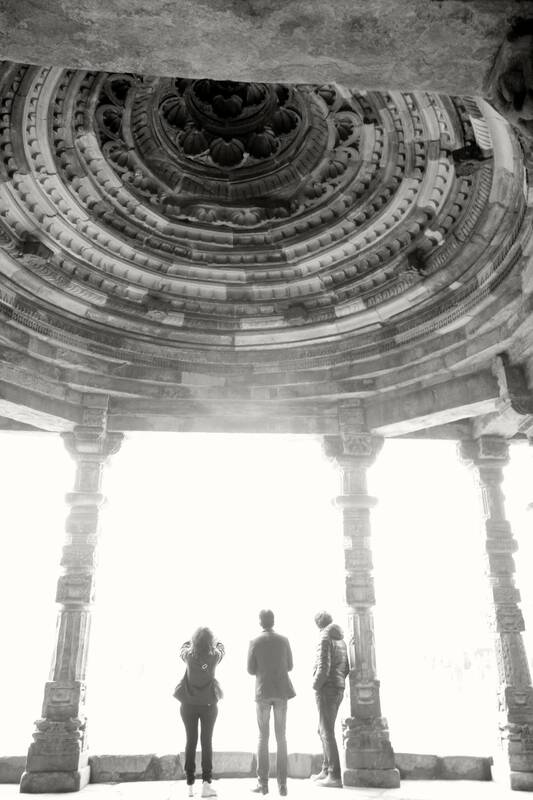 Once we had seen the fort our guide suggested going to a shop where his uncle makes marble statues. Yet another tourist trap we had to almost fight against going to. 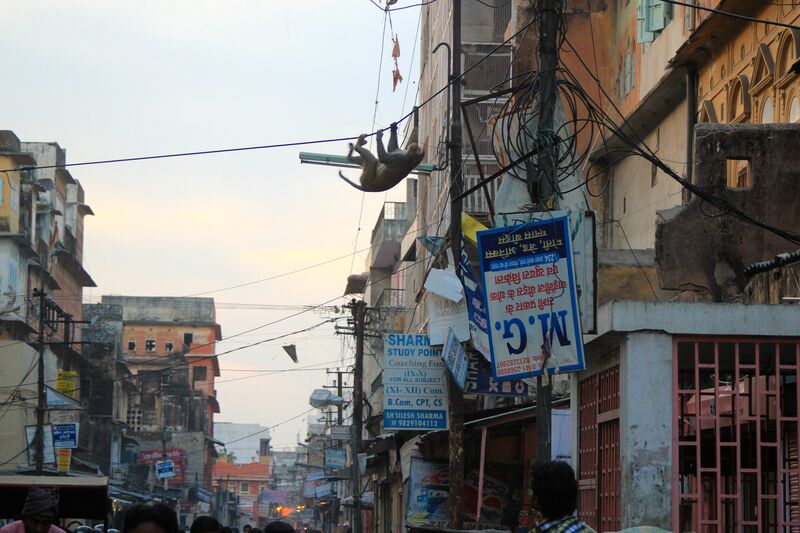 This was actually the most annoying part about sightseeing in India. Your driver and guide and everyone in between would always try their hardest to take you to shops from where they receive commission should we buy some souvenirs. This actually started to get to our nerves in the end. We just wanted to look around, take some photos and not go into any shops and not pay more money to anyone, but this almost never happened as these people are so good at making you feel guilty. After overpaying our guide, we went to look around Jaipur once more by ourselves. 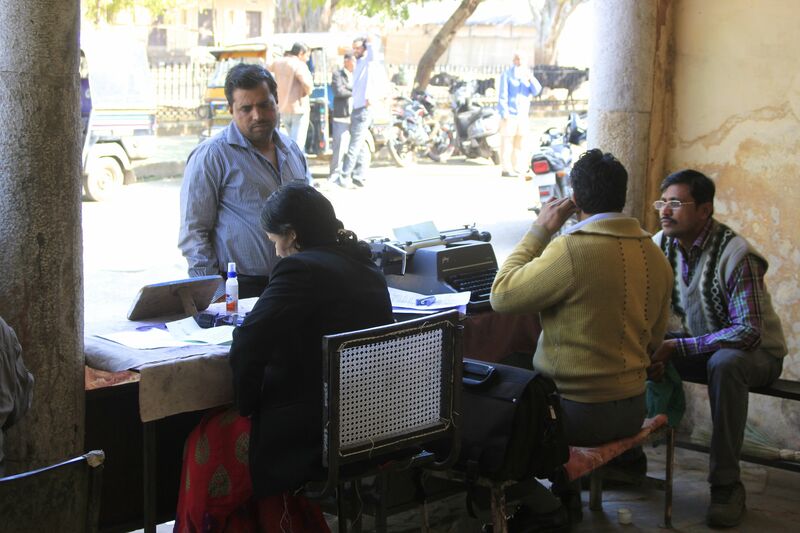 We found these people, who help people out with legal documents and write letters for people who cannot write. 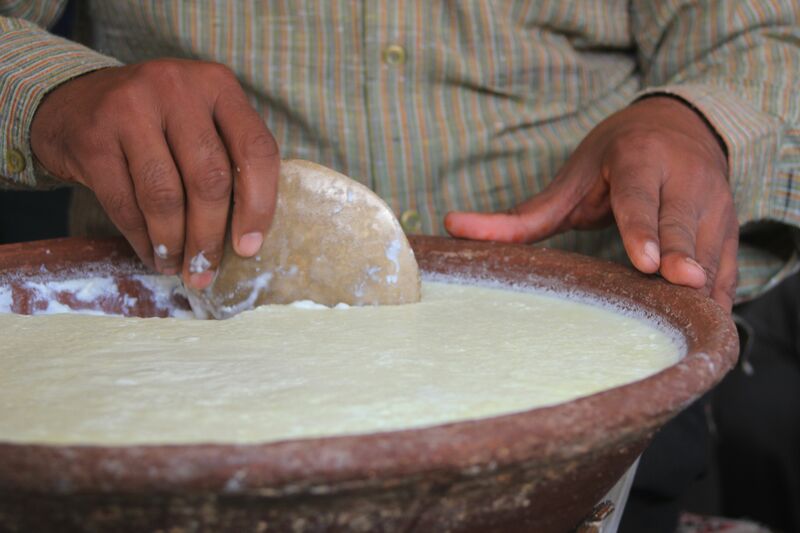 We had some wonderful lassi, which again was nothing like the lassis you get in the UK. It was a lot thicker and creamier and just amazing. They serve it in clay pots, which you can keep. We also had some wonderful street food like samosas and aloo chaat, which is a fried potato with yoghurt and chickpeas and chilli sauce. 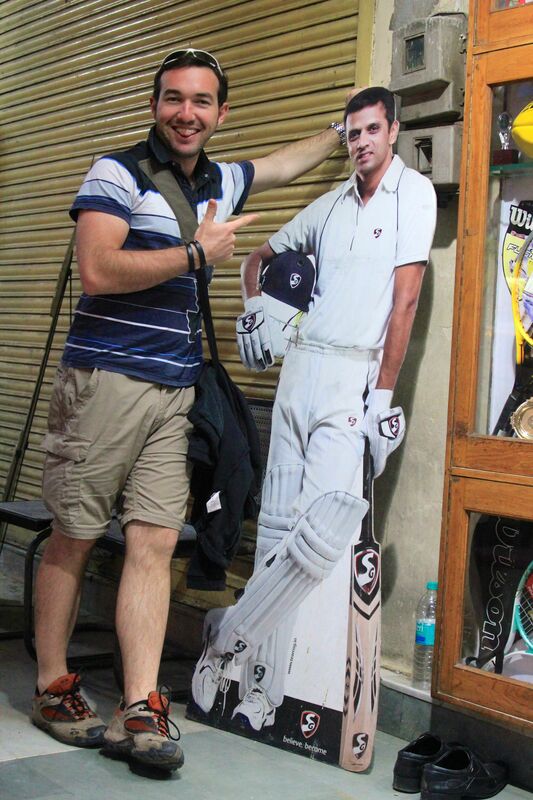 David met his hero Rahul Dravid. 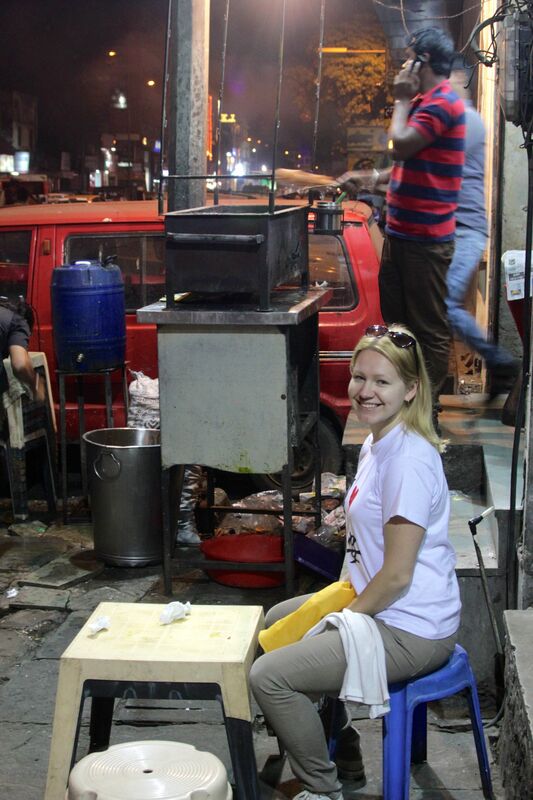 We ate the most wonderful kebabs in the grubbiest places. 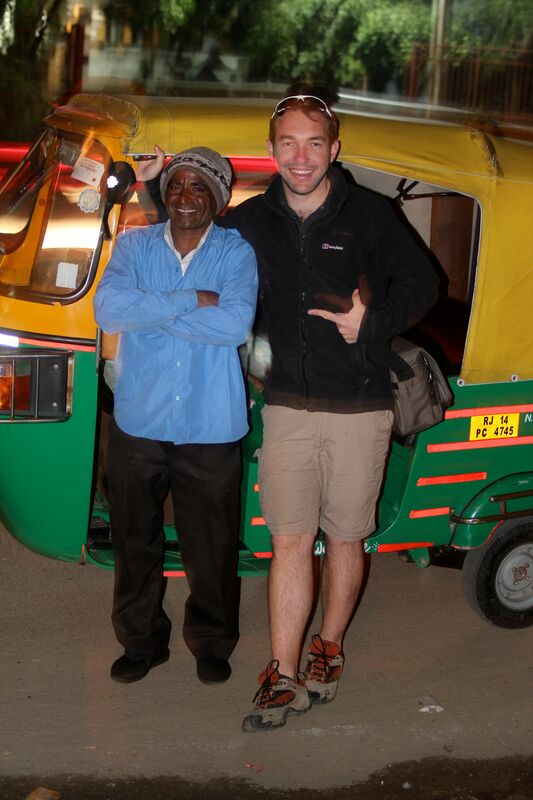 We experienced the bumps in the roads on autorickshaws and met some drivers with the craziest stories. 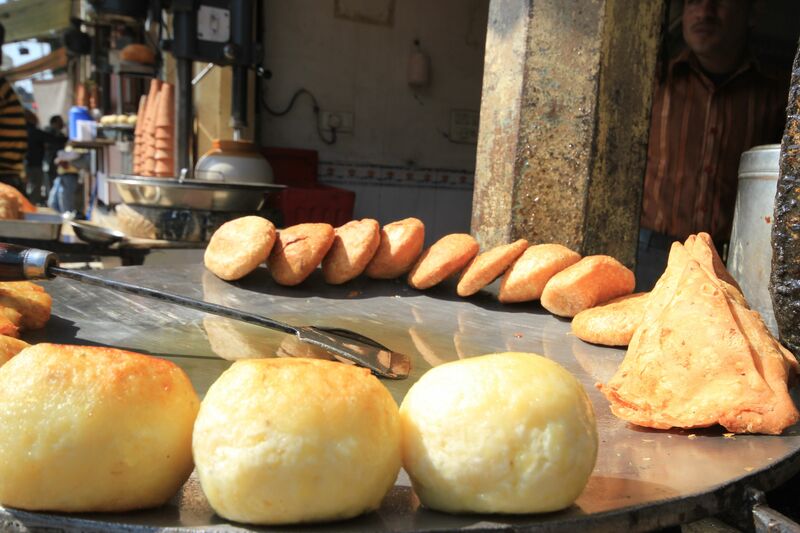 We then went back to Delhi for a day and then to England for a week, which went by too quickly seeing friends, catching up and surprise, surprise – eating. We are now back in Estonia and I am about to go and walk our dog in Võru. Being at home feels good, but I do hope we’ll find a job soon, because doing nothing sounds good, but is quite boring after a couple of days. I will try to keep the blog updated with snippers of Estonian life and how we’re getting on, but they may not be as regular as they were in China. Posted in India, PlacesTagged Agra, Amer Fort, Delhi, Estonia, Fatehpur Sikri, India, Jaipur, Shah Jahan, Taj MahalBookmark the permalink.